As genetic research develops apace in the modern age, the possibility of extending the life span of animals, and by extension, human beings, becomes ever greater and has already been achieved with small invertibrates. In this fascinating and though-provoking book, D.G. John discusses the history and development of the human brain from pre-history to the present day, and contends that while 'immortaility' for the human being species is a very long way away in terms of what is possible scientifically, it is possible, with many years of concentration and practice, to take control of your own subconscious brain and by doing so improve the body's ability to 'self heal'. Along with its detailed historical coverage and discussion, this book presents a comprehensive series of exercises and disciplines, each to be built upon the other, that will help any reader to improve their self-control and increase their health and well-being. 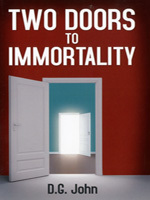 There are therefore two doors to immortality: science is one, but your own mind is the other.